Working for the benefit of our local business community and allowing for increased efficiency in the administration of LFP’s business tax program, City staff participated in the Local Business and Operations Tax Apportionment Task Force created by Engrossed House Bill 2005. The task force was comprised of city and business representatives and chaired by the Washington Department of Revenue. 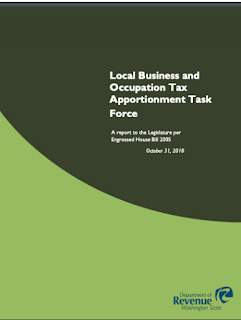 Earlier this month, the Department of Revenue submitted the task force report to the Legislature.